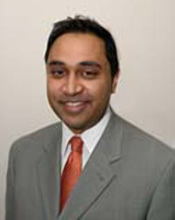 Dr. Gupta obtained his Bachelor's of Arts and Sciences degree in molecular biology at Northwestern University in Chicago. He proceeded on at Northwestern University Medical School to obtain his medical degree. With his extensive training, Dr. Gupta is involved in minimally invasive surgery in joint replacements as well as advanced arthroscopic surgery. His favorite procedures are fixing complex fractures, joint replacements of the hip, knee, shoulder, and elbow, and arthroscopic reconstructions of the knee and shoulder including ACL reconstructions, rotator cuff repairs, and shoulder instability repairs. Dr. Gupta is now an active panel member of the Southern California Trauma Syndicom to discuss complex orthopedic trauma cases with other expert orthopedic traumatologists. The panel of experts helps to bring the most advanced treatment options to community hospitals in the care of complex fractures. Dr. Gupta is an active member of the American Academy of Orthopedic Surgeons. He has been the author and presented several research papers including patellar stabilization techniques and approaches to elbow radial head fractures.